The earliest settlers were primarily big game hunters, leaving archeological evidence of stone and simple weapons. Between 1100 and 1300 AD, Native American people settled the area. The Mandan tribe moved up the Missouri River to the Heart River where they established their villages. The first white men to the area were European explorers. The French Canadians came in 1738 �up� the Red River from what is now the Pembina area searching for a water route to the Pacific Ocean. While unsuccessful in finding a Northwest Passage, they noted the abundance of fur-bearing animals. They developed friendships with and lived among the peaceful, agricultural Mandan Indians who had settlements throughout the area including the On-A-Slant Villages south of present-day Mandan. Representatives from the Northwest Company established a fur trading expedition post at the junction of the Heart and Missouri Rivers in 1780. From 1763 to 1800, the claim to the Louisiana Territory passed from France to Spain and back again to France. In 1803, France sold the territory, including the Mandan area, to the United States in what we know today as the Louisiana Purchase. Lewis and Clark and their Corps of Discovery followed the Missouri River to explore the territory. The expedition wintered at Fort Mandan (1804-5) in the Mandan Native American villages located 35 miles to the north. After reaching the Pacific Coast, they returned via the Missouri River in 1806. The designation of the State highway along the western bank of the river (ND Hwy 1806) recognizes the event. Fort Clark was founded as an American Fur Company trading post in 1831. Located on the west bank of the Missouri River and north of present-day Mandan, the post was named to honor General William Clark (of the Lewis and Clark Expedition). But by the 1840s, the fur-bearing animal population was being exhausted which reduced the major source of food and income for many tribes. Many native people resented the incursions onto their homelands and the prior peaceful relationships began to falter. Meanwhile, white settlers continued to slowly immigrate to the area hindered in part by the challenging climate, the remote location and increasing Indian uprisings. In 1864 Congress provided a major boost to settling the West by establishing the Northern Pacific Railroad and associated land grants to help finance the venture. Some stability was brought by a treaty in 1868, in which the U.S. pledged to keep settlers out of specified areas. In return some of the Sioux, but not all, agreed to remain on reservations west of the Missouri River. However railroad expansion and the discovery of gold would re-ignite open warfare. The first permenant military presence in the region was Fort Rice established in July 1864 approximately 25 miles south of present day Mandan. Among its many successes was the rescue of the Fisk Expedition enroute to the gold fields in Montana from "hostiles" near Marmarth ND. The fort hosted a major peace council in 1868. This gathering led to the Laramie Treaty which defined Sioux lands as those west of the Missouri River in Dakota Territory. To provide protection for the approaching rail line from the east and the homesteaders who would surely follow, the US army established two outposts in 1872 and 1873. Fort Greeley (later renamed Fort Hancock) was founded first on the east side of the river. On the west side, an infanty post named Fort McKeen was constructed on bluffs above the former fur-trading post. Later in 1873 Congress authorized the addition of a cavalry post and changed its designation to Fort Abraham Lincoln when foot soldiers were deemed ineffective against their mounted adversaries. A permanent civilian settlement known as "Lincoln" was adjacent to the north side of the fort. After the establishment of Fort Abraham Lincoln and later Fort Yates, Fort Rice was abandoned and dismantled in 1878. The greater portion of the fort in combination of a total of four acres of land were deeded to the State of North Dakota in July 1913 and remains a state park today. Fort Lincoln received its abandonment orders in June 1891. The former fort has also been converted into a North Dakota state park. Morton County was created by the 1872-1873 territorial legislature. It is named for Oliver Hazard Perry Throck Morton, Governor of Indiana during the civil war and a US Senator at the time the county was established. Once the Northern Pacific Railroad announced the location for its western approach to its Missouri River bridge crossing, a new settlement appeared there in December 1878 approximately 5 miles north of Fort Abraham Lincoln. The city was also to serve as base camp for the westward survey of the rail line. The first attempt at industrial development started with the establishment of a lignite mine at Sims also in 1873. However its operation eventually failed. Supplies were brought across the river in the winter months with temporary track laid on the ice during the winter and via barge during warmer months. An article on the practice was included in the national magazine �Harper's Weekly." The rail bridge would not be complete until later in 1882. Postal service had initially been provided to what is today Morton County at Fort Rice from 1866 to 1870. A post office was operated at Fort Abraham Lincoln from 1873 through 1894. Until civil service reforms in the 20th century, thousands of political supporters were rewarded with appointments as postmasters and given broad power. Four different postmasters coincided with four separate designations for area's post office. The city's first post office in 1878 was known as "Morton." The name "Mandan" stuck for only eight (8) days in March 1879 before becoming "Cushman." Ultimately in September 1879, the post office returned to its current designation of "Mandan." The Morton County government was formally organized March 23, 1878. 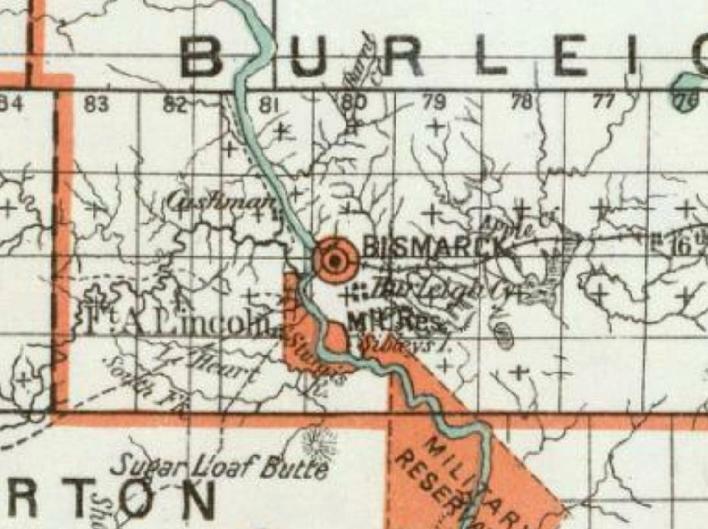 However the 1879 legislature later attached the eastern portion of Morton County to Burleigh County. This reassignment of authority effectively nullified the organization of the Morton County government. The Dakota Territory's 1881 legislature returned the detached portion to Morton County and the government was reorganized on February 18 of that year. The City of Mandan was incorporated one week later on February 24, 1881 and was named for the Mantani Indians, or "people of the bank." It became the county seat for the replatted Morton County. The City of Lincoln had been county seat from 1878 through 1879. Upon completion of the railroad to Montana in 1881, Fort Abraham Lincoln had fulfilled its primary purpose and gradually declined until abandoned in 1894. The City of Lincoln eventually dwindled into obscurity. While the railroad was critical to area development, other modes of transportation also impacted early growth, spurred by gold discoveries. In 1873, four steamboats were traversing the Missouri River working to supply the gold fields in Montana and included the "Montana," the "Dakota" plus two smaller versions known as the "Rosebud" and "Bighorn." The riverfront dock, originally known as "Bellows Landing" and later renamed "Rock Haven" was located north of the city, and is near the present day MDU Heskett power generating station north of the refinery. Colonel George Custer led a survey expedition from Fort Lincoln in 1874 to the Black Hills to confirm the existance of gold there. Whites were settling west of the Missouri in 1875, contrary to the Laramie Treaty. This development led to multiple Indian uprisings. Once the gold story got out, treasure-seekers would travel to Bismarck by train and then take the Bismarck to Deadwood Stage to seek their fortunes. Operated by the Northwest Express and Transportation Company, the stage operated from 1877 to 1880, stopped while enroute with both supplies and passengers. One-way fare was $23.00 and entailed 21 stations; with two being overnight stops. To attract settlers and investment dollars, frontier communities would advertise in commercial publications and East Coast periodicals to entice people and businesses to locate in the area. One promotion sponsored by Morton County compared Mandan to Omaha, Nebraska due to its proximity to the rail line and the Missouri River. Transportation routes are vital to both agricultural and industrial operators. In 1903, the State Reform School opened at Mandan to provide correctional and rehabilitation services to it�s youth. Today, it is known as the ND Youth Correctional Center. The Bismarck Indian School, one of approximately thirty non-reservation boarding schools located in the nation, was opened in 1907 despite the protests of Mandan residents who wanted the school to be located in their city. The school operated until 1937. 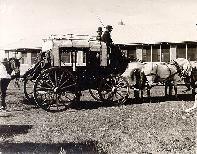 As the pioneer business community flourished, so did its post office. 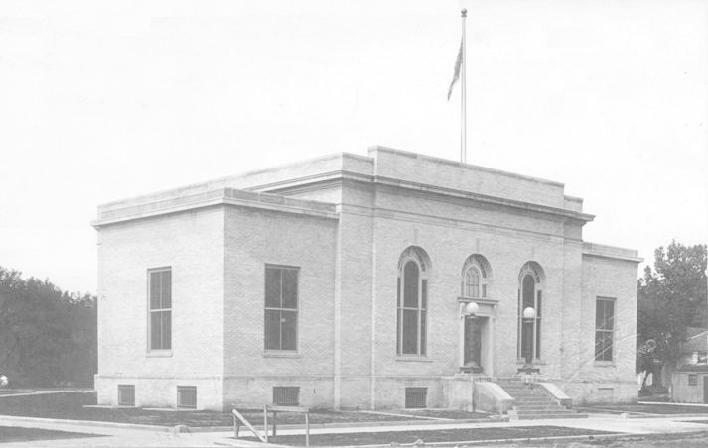 In 1911, the US Postal Service authorized construction of a "Class C" Federal Building for Mandan based on its growing receipts. Designed during the tenure of James Knox Taylor as Supervising Architect of the Treasury, Taylor believed Federal buildings were to be built as monuments to democrocy rather than issuing a standardized design. Local attributes were incorporated when possible into the design. The building opened for use in November 1915. Construction on the first motor vehicle bridge across the Missouri River in North Dakota was started in 1920 and completed in 1922. The three-truss steel Liberty Memorial Bridge was the final coast-to-coast link of U.S. Highway 10. Heart River flooding had been a common occurrence. Major floods were noted in 1881, 1887, 1910, 1929, 1937 and 1943 and repeatedly caused extensive damage. Flood control projects began as early as the 1920s. Completion of the Garrison Dam on the Missouri River in 1954 was instrumental in controlling the damage. Other projects throughout the southeastern part of the city along the Heart River continued into the 1980s. Hebron Fire and Pressbrick Factory was founded in 1904. The factory was one of at least 18 ND brick factories in the early 1900s offering an alternative to prairie sod for homes and buildings. The company has survived two world wars, a major fire in 1926, and the Great Depression. After over a hundred years of existence, Hebron Brick is not only the only surviving brick factory in the state, it is also the oldest manufacturing company of any kind in North Dakota. With the continued growth in the agricultural sector, the area was was ready for the addition of agricultural processing operations. In 1915, Hoy Russell with his partner George Schultz established the Mandan Produce and Creamery in Mandan. Pork processing was added in the 1950s. While the food service business was sold off in the mid-1990s, the Cloverdale Meat Company remains on of the largest businesses in the area. In February 1952, Standard Oil of Indiana announced plans to build a 15,000 barrel per day refinery north of Mandan. In 1953, construction began on a crude oil pipeline from Tioga to Mandan. In June 1952, Service Pipeline announced it would build an outbound product pipeline. By September, Standard Oil of Indiana announced it would double the capacity to 30,000 barrels of oil per day. The refinery was dedicated in 1954. Its current owner, Tesoro Refining and Marketing, boasts a stream day capacity of 72,000 barrels. The R. M. Heskett Electrical Generation Station at Mandan is owned and operated by Montana Dakota Utilities and went into service in 1954; an addition to this plant was energized in 1963. By 1959, the city boasted five elevators, with a combined capacity of over 760,000 bushels. Occident Elevator had two facilities, one located in the "Syndicate" area of town - in the vicinity of current day Mary Stark Elementary School and the second along Main Street. The other grain storage and handling businesses included Slope Grain and Feed Company; the Farmers Union Grain Association and the Mandan Farmers Co-Op Elevator. Morton County is home to 27,471 residents, of which 18,331 live in Mandan per the 2010 census. The city remains tied to railroad operation with a major rail equipment maintenance facility operated here by Burlington Northern Santa Fe (BNSF) Railway. The city remains a distribution center for grain, livestock, and dairy operations aided by its rail connections and proximity to Interstate Highway 94. The city has a large cattle market and food-processing plant. Other industries include iron and fabricated metal, wood, concrete and tile products in addition to oil refinery and coal-fired electrical power generation. Service industries are represented by a state-wide trade association and a data entry center. Technology is represented by a software development company and a USDA agricultural research center.